The European Union's 27 member states are being urged to do more to turn Europe into a smoke-free zone. Health Commissioner Markos Kyprianou raised the prospect of EU-wide legislation to achieve this goal, as he launched a public debate in Brussels. Officials say passive smoking kills 79,000 Europeans per year - about one in nine of all tobacco-related deaths. 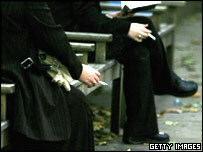 Ireland was the first EU country to ban smoking in all indoor public spaces and the UK will follow suit this year. Some other EU countries have introduced partial bans, which allow smoking rooms in bars and restaurants. A poll published last year suggested that smoking bans were popular in countries where they had been introduced. Overall, more than 80% of respondents across the EU said they favoured a ban in all public indoor spaces - though the figure dropped to 61% when respondents were asked specifically if they supported a ban in bars. Imperial Tobacco, the maker of John Player, Davidoff and West cigarettes, said there was insufficient scientific evidence to establish that "other people's tobacco smoke is a cause of any disease". "Where regulations are introduced, we support those that accommodate both smokers and non-smokers and therefore retain an element of freedom and choice," the company said. But health experts urged the EU to do more than introduce public smoking bans, and to actively help smokers to give up. Ireland's ban, the first in the EU, was introduced in 2004. Scotland has already followed suit, and the rest of the UK will step into line on 1 July. Italy, Sweden, and Malta have partial bans which allow smoking in closed-off, separately ventilated areas. Estonia and Finland are introducing similar measures later this year. France will follow suit next year after introducing a ban on smoking in offices, hospitals, schools and shops on Thursday this week. Belgium, Lithuania, Spain, Cyprus, Slovenia and the Netherlands all provide exceptions of different kinds for the hospitality sector. Most member states ban or restrict smoking in buildings such as hospitals, schools, government buildings, theatres, cinemas and public transport. There are other countries, however, such as Germany, which have no plans for a smoking ban. Mr Kyprianou sketched a number of options for increasing the use of smoke-free zones. Mr Kyprianou is thought to be in favour of legislation. "The goal of the green paper is to promote debate on the issue and to seek views from government, MEPs and other interested parties on what role if any the EU could play," Mr Kyprianou's spokesman said.